Mother Nature often doesn’t like to play nice. While we’d hope that if we had to spend the night in the woods, it would be nothing but clear skies and perhaps just a bit cool, the reality is you are just as likely to be sitting in the middle of a steady rain with not a dry twig in sight for the evening fire. But, as they say, where there’s a will there’s a way. If you have a sturdy knife, you can find dry wood, even in a downpour. I do have to stress, though, that the knife must be of good quality. A cheap “Made in China” knock off probably won’t stand up to this sort of abuse. Most folding knives aren’t going to have the blade length necessary, either. Ideally, your blade should be four to five inches in length or longer. Batoning firewood is an age-old technique for splitting wood in the field. The objective is to split thick branches so as to expose the dry wood inside. To baton properly, as well as safely, you need your knife and a solid surface, such as a flat rock or a tree stump. You can do this on packed earth as well, but I’ve found having a harder surface makes the job much easier. The branches you select to baton or split need to be thinner than the length of your knife blade. For example, if your blade is five inches long, search for limbs that are about three inches thick. As for branch length, look for branches up to about three feet or so. While I’ve successfully batoned branches upwards of five feet long, shorter lengths make things easier to handle. If need be, you can always break or chop long branches into shorter pieces. Concentrate your search on dead wood that is off the ground, either low branches still attached to trees or branches that have fallen but are resting on rocks or logs. The reason for this is branches lying directly on the ground will have absorbed more moisture and are less likely to be dry inside. You will also need one branch to act as a hammer of sorts. A solid piece of wood around eighteen inches in length and a couple of inches thick will do the trick nicely. Position the branch vertically on your rock or tree stump. 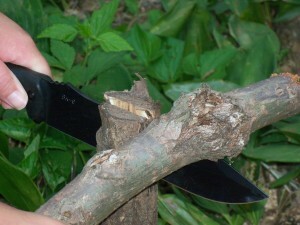 Place the blade of your knife across the top of the branch, with the blade edge facing into the wood, making a T shape. The blade should extend beyond the side of the branch by a couple of inches at least. Next, pick up your “hammer” stick and gently tap the spine of your knife blade, driving the edge into the wood. As it digs deeper, strike the blade more firmly and toward the tip of the blade. Continue driving the blade through the branch until it splits completely or until you’ve reached a point where you can easily pull the pieces apart by hand. The wood inside should be dry and ready to burn. 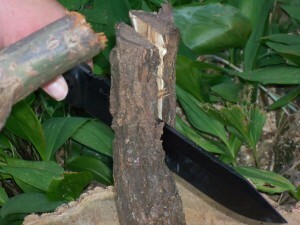 Batoning is an excellent addition to the wilderness survival skills toolbox. We practice this in our yard. 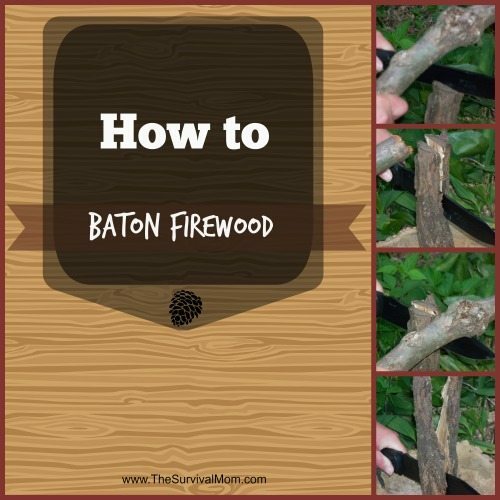 Great for making kindling! We also like to feather sticks for kindling.